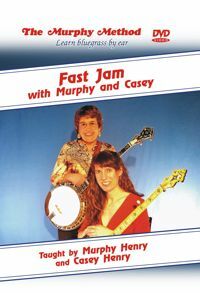 Fast Jam with Murphy and Casey: If our Slow Jam DVDs are too slow, you are ready to take on the Fast Jam! Murphy and Casey gather once more with Malia Furtado on fiddle and for the first time with Steve Spence on bass to pick twenty-one songs that will test your speed and hone your jamming ability. Want to learn breaks to these songs? Here’s a list of where you can find them!